Received: August 10, 2017; Revised: August 21, 2018; Accepted: September 19, 2018; Published online: December 31, 2018. Several epidemiologic studies have suggested that the urine sodium excretion (USE) can be estimated in lieu of performing 24-hour urine collection. However, this method has not been verified in patients with chronic kidney disease (CKD) or in an interventional study. The purpose of this study was to evaluate the usefulness of estimating USE in a prospective low-salt diet education cohort (ESPECIAL). A new formula was developed on the basis of morning fasting urine samples from 228 CKD patients in the ESPECIAL cohort. This formula was compared to the previous four formulas in the prediction of 24-hour USE after treatment with olmesartan and low-salt diet education. Most previously reported formulas had low predictability of the measured USE based on the ESPECIAL cohort. Only the Tanaka formula showed a small but significant bias (9.8 mEq/day, P < 0.05) with a low correlation (r = 0.34). In contrast, a new formula showed improved bias (−0.1 mEq/day) and correlation (r = 0.569) at baseline. This formula demonstrated no significant bias (−1.2 mEq/day) with the same correlation (r = 0.571) after 8 weeks of treatment with olmesartan. Intensive low-salt diet education elicited a significant decrease in the measured USE. However, none of the formulas predicted this change in the measured urine sodium after diet adjustment. We developed a more reliable formula for estimating the USE in CKD patients. 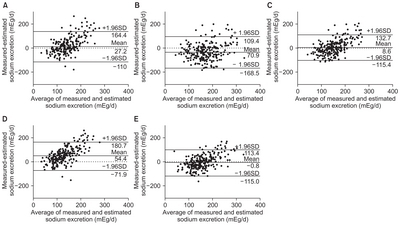 Although estimating USE is applicable in an interventional study, it may be unsuitable for estimating the change of individual sodium intake in a low-salt intervention study. Epidemiological studies have found that the prevalence of high blood pressure (BP) is directly associated with dietary salt intake . Hypertension (HTN) is a major factor associated with worsening chronic kidney disease (CKD). High salt intake is also associated with BP-independent target organ damage, including renal disease. In most animal models of renal injury, high salt intake leads to increased albuminuria and deterioration in glomerulosclerosis . Therefore, it is important to determine a patient’s current level of sodium intake and to encourage complete salt restriction, particularly in patients with CKD. The Kidney Disease: Improving Global Outcomes (KDIGO) guidelines recommend lowering salt intake to < 90 mEq (< 2 g/day) in adults . However, previous research suggests that approximately 85% of patients with CKD consume > 100 mEq/day of sodium . Educating CKD patients regarding a low-salt diet (LSD) represents a non-pharmacological treatment for HTN. One randomized controlled trial of British patients who were not taking antihypertensives found that switching from an LSD of 10 to 5 g/day improved BP control (7.2 mmHg in systolic readings and 3.2 mmHg in diastolic readings) . A 24-hour urine sodium collection is the gold standard of measuring salt intake, because most dietary sodium is excreted in urine assuming there is no water loss due to sweating or diarrhea. However, 24-hour urine collection is inconvenient, and may be incomplete or inaccurate due to poor patient compliance. Estimating the urine sodium excretion (USE) from spot urine specimens is convenient and less burdensome than is a 24-hour collection. Repeat spot urine samples are also easy to obtain for measurement of sodium levels. Despite its convenience, however, this method has not been extensively studied to estimate sodium intake in a real-world population. Use of INTERSALT, Kawasaki, and Tanaka formulas has been suggested for a healthy population [6–8]. However, CKD patients were considered inappropriate candidates for these studies given the variable patterns of sodium excretion and reabsorption due to renal dysfunction. The Tanaka formula showed a lower correlation than that found among a healthy population when applied to CKD patients . Nerbass et al  described the Nerbass formula, which predicts 24-hour USE in CKD patients. Although several studies have suggested the efficacy of an equation/formula to predict USE (even in CKD patients), the results have been inconsistent [10–12]. It may be informative to use spot urine samples to develop and validate equations for USE in patients with CKD given variable patterns of sodium handling given lower glomerular filtration rate (GFR) and potential tubular damage. Therefore, it is recommended to use study- and survey-specific calibrations of spot urine specimens to estimate a mean 24-hour USE to improve the validity of the estimates . However, this has neither been extensively verified in patients with CKD, nor reported in interventional studies (such as LSD). Both pharmacologic and non-pharmacologic interventions used in patients with HTN or CKD can affect a patient’s daily sodium intake or excretion. These effects may also be seen in placebo groups [13,14]. We sought to evaluate the utility of estimating the USE in an intensive LSD education cohort that studied non-diabetic CKD patients (ESPECIAL cohort). Our prospective study enrolled 233 patients diagnosed with CKD who participated in the ESPECIAL (Effects of Low Sodium Intake on the Antiproteinuric Efficacy of Olmesartan in Hypertensive Patients with Albuminuria) trials. The methods of the ESPECIAL study have been previously published in detail . Briefly, patients were selected from those who visited outpatient renal clinics at seven Korean centers between March 2012 and March 2013. All participants met the following inclusion criteria: age 19 to 75 years; diagnosis of HTN or reported use of a prescription antihypertensive; estimated GFR (eGFR) ≥ 30 mL/min/1.73 m2; random urine albumin to creatinine (Cr) ratio ≥ 30 mg/g; Cr measured more than twice with ≥ 1-week interval in the last 6 months. These patients fulfilled the KDIGO criteria for the diagnosis of CKD . Participants using diuretics were instructed to discontinue its use two months prior to the start of the study. Exclusion criteria included: uncontrolled HTN (BP > 160/100 mmHg); pregnant women; active malignancy; a diagnosis of cardiovascular disease within the previous 6 months; hyperkalemia (serum potassium > 5.5 mEq/L); and diabetes mellitus. In the ESPECIAL cohort, intensive LSD education was supported by a dietary consultant and telephone feedback for 30 minutes once a week during the study period. Conventional LSD education was defined by routine LSD instructions given at an outpatient clinic. The study protocol was approved by the institutional review boards at the seven study centers (representative site: Kyung Hee University Hospital). Written informed consent was obtained from each patient prior to study inclusion. Based on the study design, samples were obtained at 0, 8, and 16 weeks. Patients were instructed to collect 24-hour urine samples. Fasting morning spot urine samples were obtained on the day of the visit. All urine specimens were refrigerated at 4°C within 24 hours of collection, and frozen at −20°C within 7 days. Frozen aliquots of spot urine samples were shipped to the laboratory at Kyung Hee University, Seoul, Korea. Sodium and potassium levels were measured using emission flame photometry. Cr was measured using the Jaffé method. Height, weight, and blood chemistries were measured at each visit. Renal function was assessed using the eGFR based on the Modification of Diet in Renal Disease formula . We developed a 24-hour USE estimation formula in the baseline data (week 0) using a linear regression method. In studies using 24-hour urine collection, it is important to determine the adequacy of the urine collection. With regard to the test’s adequacy of urine collection, we followed the same criteria that were applied to a previous study that estimated the excretion rate of Cr in CKD patients . Based on this criterion, five participants were excluded from this study. Estimated daily sodium consumption (mEq/day) = [2.07 × weight (kg)] + [0.36 × spot urine Na (mEq/L)] + [1.09 × age (years)] + [0.34 × spot urine K (mEq/L)] − [0.17 × spot urine Cr (mg/dL)] − 75.49. All analyses and calculations were performed using SPSS statistics ver. 19.0 (IBM Co., Armonk, NY, USA). Continuous and categorical variables were expressed as means ± standard deviations (SD), or as percentages. Estimated values were expressed as means and SDs. The difference between the measured and estimated values was expressed as a mean and 95% confidence interval. The rate of reduction of the USE was expressed as a mean and SD in cases with normally distributed data. A paired t test was used to compare the USE between measured and estimated values. Correlation analysis was used to assess the relationship between measured and estimated values. The Bland-Altman plot was used to estimate the difference and limits of agreement between the measurements and estimations (obtained using each respective formula). The receiver-operating characteristic (ROC) curve was used to analyze the sensitivity and specificity of the rate of reduction of the estimated USE with regard to the measured USE. Table 1 shows the clinical and laboratory characteristics of the enrolled patients. The mean patient age was 49.9 ± 13.0 years. Women comprised 49.1% of these patients. The mean serum Cr was 1.2 ± 0.4 mg/dL, with a mean eGFR of 65.7 ± 23.9 mL/min/1.73 m2. None of the 228 patients had significant hyponatremia or hypernatremia. The mean 24-hour USE was 154.1 ± 69.6 mEq/day at baseline. The mean 24-hour USE did not change significantly after eight weeks of treatment with olmesartan (156.5 ± 70.7 mEq/day). After an additional 8 weeks of randomized LSD education (at week 16), the mean 24-hour USE was 121.2 ± 59.4 mEq/day in the intensive LSD education group and 145.2 ± 60.0 mEq/day in the conventional LSD education group. However, the intensive education group demonstrated a significant decrease in the 24-hour USE compared to that of the conventional LSD group (P < 0.001). We used the previously reported INTERSALT, Kawasaki, and Tanaka formulas in healthy populations and the Nerbass formula applied to a CKD population to predict the baseline 24-hour USE. The mean estimated USE (mean, 144.3 mEq/day) using the Tanaka formula was the closest to the mean measured USE (mean, 154.1 mEq/day) compared to those of the INTERSALT (mean, 126.8 mEq/day), Kawasaki (mean, 181.3 mEq/day), and Nerbass formulas (mean, 100.0 mEq/day). However, all of the formulas produced results that were significantly different from the measured values. Furthermore, the correlation coefficient between the estimated USE using the Tanaka formula and the measured USE was low (r = 0.340). The Nerbass formula had the best correlation (r = 0.469). However, the Nerbass formula also produced the largest difference (mean bias = 33.7 mEq/day) from the measured USE (Table 2). 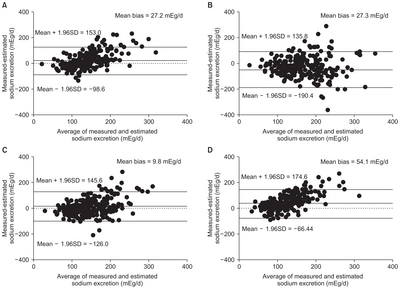 Bland-Altman plots demonstrated larger biases (difference between measured and estimated USE) at the higher USE levels (mean of measured and estimated USE) using all four formula estimates (Fig. 1). As we have described, prior formulas were not able to adequately predict measured values of the USE. Therefore, we developed a new formula for estimating 24-hour USE in CKD patients using linear regression analysis. This formula is called the ESPECIAL formula. Fig. 2A shows the association between the estimated values obtained using the ESPECIAL formula and the measured USE. The correlation coefficient was 0.569 (P < 0.001). Bland-Alt-man plots using the ESPECIAL formula showed minimal bias and few outliers (Fig. 2B). After 8 weeks of treatment with olmesartan, the mean 24-hour USE was 156.6 ± 70.6 mEq/day. The mean value of the estimated USE (mean, 157.8 mEq/day) using the ESPECIAL formula was the closest to the measured USE compared to those obtained using the other formulas. In contrast, the estimated USE obtained using the INTER-SALT (mean, 130.2 mEq/day), Kawasaki (mean, 186.0 mEq/day), Tanaka (mean, 147.9 mEq/day), and Nerbass formulas (mean, 102.1 mEq/day) significantly differed from the measured USE. The ESPECIAL formula also showed the best correlation (r = 0.571) to the measured USE, which was comparable to that of the baseline data (week 0) (Table 3). Bland-Altman plots showed that outlier biases in the Kawasaki, Tanaka, and ESPECIAL formulas had smaller ranges than those noted using the INTERSALT and Nerbass formulas (Fig. 3). Although the measured 24-hour USE did not decrease significantly in the conventional education group (mean, 145.2 mEq/day), it decreased significantly to 121.9 mEq/day in the intensive education group (P < 0.001). In the conventional education group, the mean estimated USE obtained using the Tanaka formula (mean, 151.3 mEq/day) was the closest to the measured USE compared to those of the other formulas. However, the Tanaka formula had a poor correlation (r = 0.226). In the intensive education group, the mean estimated USE based on the INTERSALT formula (mean, 120.3 mEq/day) was the closest to/most accurately matched to the measured USE. All of the estimated USEs significantly differed from the measured USE, including those based on the Kawasaki (mean, 174.7 mEq/day), Tanaka (mean, 139.2 mEq/day), Nerbass (mean, 97.0 mEq/day), and ESPECIAL formulas (mean, 149.9 mEq/day). The INTERSALT formula showed the weakest correlation with the measured USE (r = 0.448). After an 8-week randomized LSD education program, we compared the estimated USE (using five formulas) to predict an accurate reduction of the measured USE and to identify patients in whom the USE reduction rate was > 30%. These formulas included the four previously mentioned, and the newly devised ESPECIAL formula. We found that all of the formulas significantly underestimated the amount of USE. While the reduction rate of the measured sodium excretion was 10.2%, the reduction rates of estimated sodium excretion were 3.3% to 3.5%. The ROC curves analyzed and predicted the reduction ratio of the estimated USE for patients showing > 30% reduction after LSD education. Using the ESPECIAL formula to estimate the USE, the value of the area under the curve (AUC) was 0.691, which was better than that noted using other formulas. However, the AUC values ranged between 0.662 and 0.691. The AUC values were not significantly different when compared across the formulas (Fig. 4). The rate of reduction of the estimated USE had poor accuracy in predicting the rate of reduction of the measured USE, regardless of the formula used. We developed and successfully applied a newer method to predict 24-hour USE using spot urine samples in CKD patients. Although several formulas were developed to estimate the 24-hour USE from spot urine, most have not been extensively verified in patients with CKD or in an interventional study. When applied to our prospective cohort, these previously developed formulas had significant limitations. For instance, formulas with good correlation had significant biases with regard to the 24-hour USE. In contrast, those with small biases demonstrated poor correlations with respect to the 24-hour USE. Therefore, in order to produce a more precise prediction, we developed a new formula on the basis of fasting morning urine samples obtained from 228 CKD patients enrolled in the ESPECIAL cohort. We also investigated whether the formula that was applicable in patients receiving no intervention can be applied to those administered angiotensin II receptor blockers (ARBs), or practicing the education of LSD. ARBs are recommended for use in CKD patients with concomitant HTN. Compared to existing formulas, we have developed a more reliable formula for estimating the USE in CKD patients. Our formula demonstrated a good prediction rate of the measured USE with a good correlation even after 8-week treatment with an ARB (olmesartan). However, all of the formulas showed poor prediction rates for the reduction of the measured USE following intensive LSD education. For decades, researchers have tried to identify an easy and precise method of predicting salt intake, which is crucial for the management of HTN. Several formulas, including the INTERSALT, Kawasaki, and Tanaka formulas have been developed for the prediction of 24-hour USE utilizing spot urine samples in healthy populations. These formulas have successfully predicted the salt intake, rather than measuring 24-hour USE in epidemiological studies [17,18]. Recent efforts have been made to predict the 24-hour USE, even in CKD patients. Several studies have investigated the applicability of existing formulas (that were obtained from normal populations) in CKD patients. Imai et al  compared the predictive power of the Tanaka and Kawasaki formulas with respect to their ability to predict the 24-hour USE in CKD patients. The group’s results suggested that Tanaka’s equation was superior to the Kawasaki formula due to the fact that the first morning urine sample was best suited for use in clinical practice for patients with CKD. Ogura et al  also applied the Tanaka formula to CKD patients, and suggested that the spot urine can be used to estimate sodium excretion, especially in patients with low eGFR. However, the Tanaka formula performed poorly when applied to Westerners diagnosed with CKD. Another limitation was that these formulas relevant to a Japanese population were quite complicated, because both required another complex equation to estimate the daily urine excretion of Cr. Nerbass et al  report recently the development of a simpler equation based on studying CKD patients to assess sodium intake in an elderly CKD cohort. However, the authors have stated that the accuracy of this formula might be inadequate for detailed investigations or for application in other populations. In contrast to those of previous studies, the spot urine samples used in this study were not the first morning urine specimens. Instead, the urine samples were obtained in a fasting state when patients visited the outpatient clinic before visiting medical staff. A fasting ante meridiem (AM) urine sample was obtained between 8 and 11 AM, which is the most accessible time of day for patients. When we applied the existing formulas to the fasting AM urine samples obtained from patients with CKD, the Kawasaki formula overestimated the USE (27.3 mEq/day), while other formulas (INTERSALT, Tanaka, and Nerbass) underestimated it (−27.3, −9.8, and 54.1 mEq/day, respectively). Although the Tanaka formula had the smallest bias, the values obtained using this formula were significantly different from those measured by 24-hour USE. The Tanaka formula also demonstrated a weaker correlation than that observed with use of the INTERSALT and Nerbass formulas. The Nerbass formula showed a better correlation, but the most significant bias among the four formulas. Therefore, the Nerbass formula has weak predictive power. Therefore, we devised a new formula comprising age, body weight, urinary sodium, potassium, and Cr estimation. The mean difference between the measured and estimated 24-hour urinary sodium excretion was only 0.1 mEq, which indicated minimal bias and an acceptable correlation (r = 0.57, P < 0.001). In order to evaluate the performance of our formula compared to those of others, we applied our new formula and prior formulas to the second samples obtained from patients after 8 weeks of treatment with olmesartan. The measured sodium excretion (156.6 ± 70.6 mEq/day) was not significantly changed from that observed at baseline (154.1 ± 69.6 mEq/day). All of the equations demonstrated perfect reproducibility in the estimation of the USE with a similar bias and correlation coefficient when applied to the same population after ARB treatment. Our new formula also demonstrated negligible bias (1.2 mEq/day), and a good correlation when compared to the measured 24-hour USE. The results of this study also revealed some limitations of the formulas developed based on healthy population. For instance, because of the formulas are based on estimations of the 24-hour urine Cr excretion, this might lead to systemic bias in estimating the USE. The performance of these formulas, which are based on estimation of the 24-hour urine Cr excretion, has been questioned in clinical practice for use in patients with CKD . One previous study investigating the Tanaka and Kawasaki formulas evaluated one could accurately estimate the 24-hour USE in a CKD patient. Okada et al  have evaluated the performance of the Tanaka and Kawasaki formulas in patients with CKD. Although the Tanaka formula showed a better correlation than did the Kawasaki formula, it showed a non-negligible degree of bias (17 mEq/day). This bias in the Tanaka and Kawasaki formulas results from the fact that the estimation of 24-hour USE is based on estimation of the amount of 24-hour urinary Cr excretion. However, the measured and estimated amounts of Cr excreted in patients with CKD may differ significantly. Our cohort demonstrated that the measured 24-hour urine Cr (mean, 1,225.8 ± 400.7 mg/day) was significantly different from the estimated 24-hour urine Cr using the Tanaka (P < 0.001; mean, 1,302.2 ± 300.5 mg/day) and Kawasaki (P = 0.001; mean, 1,305.3 ± 376.8 mg/day) formulas. Therefore, both the Tanaka and Kawasaki formulas seem to be unreliable because they tend to systemically overestimate the 24-hour urine Cr excretion in CKD patients. If the estimation of Cr excretion is a prerequisite for 24-hour USE estimation (such as the estimation formulas based on a healthy population), the more accurate the estimation of Cr excretion, the more accurate will be the USE estimation. However, it is more difficult to estimate Cr excretion in CKD patients than it is in a healthy population. An accurate estimation method has not been developed for correctly assessing Cr excretion in CKD patients. Therefore, our formula offers an advantage in that it does not require estimation of the amount of Cr excretion to estimate the 24-hour USE. This is the first study to evaluate the efficacy of the estimation of sodium excretion in cases of pharmacological intervention, as well as education regarding LSD. An ideal equation for estimating the USE should appropriately reflect the true change in salt intake after lifestyle modifications. After education regarding the use of LSD, the USE decreased significantly in those belonging to the intensive education group (34.7 ± 7.8 mEq/day). None of the formulas could accurately predict the amount of measured 24-hour USE or the changes in 24-hour USE when applied to fasting AM urine samples after an additional eight weeks of education regarding the role of LSD. Our results indicate that the estimated USE may be unsuitable to estimate changes in individual sodium intake or in the change of the USE in a low-salt intervention study. The data could not conclusively explain the mechanism for low estimated USE noted after using the LSD intervention. No prior studies have evaluated whether and how LSD influences estimation of the USE. It is possible that LSD in CKD patients may change the diurnal pattern of sodium excretion. However, in both the intensive LSD education group and the conventional LSD group, the predicted Na excretion obtained with the ESPECIAL formula showed the best correlation with the actual Na excretion compared to those of the other formulas. However, further studies are required to estimate the circadian rhythm of BP. Another limitation of our study was that the criteria used to determine the adequacy of 24-hour urine collection in CKD patients are uncertain. Most studies performed in CKD patients have used criteria based on a healthy population [9,15,19]. However, because Cr excretion is lower in CKD patients than it is in a healthy population, even properly collected samples may have been wrongly considered inadequate and inappropriately excluded from the research. We only excluded the outlier cases (Cr excretion < 350 mg/day or > 3,500 mg/day). However, further studies are required to determine the adequacy of urine samples obtained from CKD patients. A final limitation is that we did not consider the stage of CKD patients when calculating urinary saline excretion formulas. This omission may have contributed to errors in early CKD patients, especially those with eGFR > 60 mL/min/1.73m2. Of note, however, neither the MDRD nor CKD EPI, which are representative eGFR formulas, consider the CKD stage. In conclusion, we created the ESPECIAL formula to reliably predict the 24-hour USE in CKD patients using fasting AM urine samples. This formula is convenient and useful in epidemiological studies or studies performed to assess the pharmacological interventions affecting BP. A 24-hour urine collection, however, remains the most accurate method of estimating the amount of USE in patients adhering to LSD. (A) INTERSALT, (B) Kawasaki, (C) Tanaka, and (D) Nerbass formulas. (A) Relationship between estimated sodium excretion and measured sodium excretion in spot urine using the ESPECIAL formula. (B) Bland-Altman plots. ESPECIAL, Effects of Low Sodium Intake on the Antiproteinuric Efficacy of Olmesartan in Hypertensive Patients with Albuminuria cohort trial; SD, standard deviation. (A) INTERSALT, (B) Kawasaki, (C) Tanaka, (D) Nerbass, and (E) ESPECIAL formulas. Specificity and sensitivity of estimated urine sodium excretion to assess the reduction in measured sodium excretion > 30%. (A) INTERSALT, (B) Kawasaki, (C) Tanaka, (D) Nerbass, and (E) ESPECIAL formulas. AUC, area under the curve; ESPECIAL, Effects of Low Sodium Intake on the Antiproteinuric Efficacy of Olmesartan in Hypertensive Patients with Albuminuria cohort trial. Data are presented as number only, mean ± standard deviation, or number (%). CKD, chronic kidney disease; GFR, glomerular filtration rate; LSD, low-salt diet. Data are expressed as mean ± standard deviation or median (95% confidence interval). ESPECIAL, Effects of Low Sodium Intake on the Antiproteinuric Efficacy of Olmesartan in Hypertensive Patients with Albuminuria cohort trial; USE, urine sodium excretion. ESPECIAL, Effects of Low Sodium Intake on the Antiproteinuric Efficacy of Olmesartan in Hypertensive Patients with Albuminuria cohort trial; LSD, low-salt diet; USE, urine sodium excretion. MacGregor, GA (1985). Sodium is more important than calcium in essential hypertension. Hypertension. 7, 628-640. Ritz, E, Koleganova, N, and Piecha, G (2009). Role of sodium intake in the progression of chronic kidney disease. J Ren Nutr. 19, 61-62. Andrassy, KM (2013). Comments on ‘KDIGO 2012 Clinical Practice Guideline for the Evaluation and Management of Chronic Kidney Disease’. Kidney Int. 84, 622-623. Kutlugün, AA, Arıcı, M, and Yıldırım, T (2011). Daily sodium intake in chronic kidney disease patients during nephrology clinic follow-up: an observational study with 24-hour urine sodium measurement. Nephron Clin Pract. 118, c361-c366. Cappuccio, FP, Markandu, ND, Carney, C, Sagnella, GA, and Mac-Gregor, GA (1997). Double-blind randomised trial of modest salt restriction in older people. Lancet. 350, 850-854. Kawasaki, T, Itoh, K, Uezono, K, and Sasaki, H (1993). A simple method for estimating 24 h urinary sodium and potassium excretion from second morning voiding urine specimen in adults. Clin Exp Pharmacol Physiol. 20, 7-14. Tanaka, T, Okamura, T, and Miura, K (2002). A simple method to estimate populational 24-h urinary sodium and potassium excretion using a casual urine specimen. J Hum Hypertens. 16, 97-103. Brown, IJ, Dyer, AR, and Chan, Q (2013). Estimating 24-hour urinary sodium excretion from casual urinary sodium concentrations in Western populations: the intersalt study. Am J Epidemiol. 177, 1180-1192. Nerbass, FB, Pecoits-Filho, R, McIntyre, NJ, McIntyre, CW, and Taal, MW (2014). Development of a formula for estimation of sodium intake from spot urine in people with chronic kidney disease. Nephron Clin Pract. 128, 61-66. Kang, SS, Kang, EH, Kim, SO, Lee, MS, Hong, CD, and Kim, SB (2012). Use of mean spot urine sodium concentrations to estimate daily sodium intake in patients with chronic kidney disease. Nutrition. 28, 256-261. Imai, E, Yasuda, Y, and Horio, M (2011). 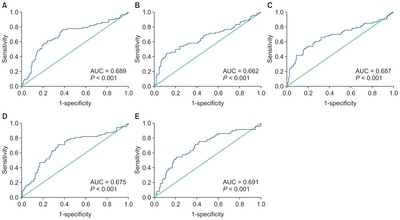 Validation of the equations for estimating daily sodium excretion from spot urine in patients with chronic kidney disease. Clin Exp Nephrol. 15, 861-867. Okada, T, Hayashi, A, and Nakao, T (2012). Is the estimation of daily urinary sodium excretion in patients with chronic kidney disease sufficiently accurate in clinical practice?. Clin Exp Nephrol. 16, 975-976. Fujii, T, Uzu, T, and Nishimura, M (1999). Circadian rhythm of natriuresis is disturbed in nondipper type of essential hypertension. Am J Kidney Dis. 33, 29-35. Fukuda, M, Wakamatsu-Yamanaka, T, and Mizuno, M (2011). Angiotensin receptor blockers shift the circadian rhythm of blood pressure by suppressing tubular sodium reabsorption. Am J Physiol Renal Physiol. 301, F953-F957. Hwang, JH, Chin, HJ, and Kim, S (2014). Effects of intensive low-salt diet education on albuminuria among nondiabetic patients with hypertension treated with olmesartan: a single-blinded randomized, controlled trial. Clin J Am Soc Nephrol. 9, 2059-2069. Ix, JH, Wassel, CL, and Stevens, LA (2011). Equations to estimate creatinine excretion rate: the CKD epidemiology collaboration. Clin J Am Soc Nephrol. 6, 184-191. Han, SY, Hong, JW, Noh, JH, and Kim, DJ (2014). Association of the estimated 24-h urinary sodium excretion with albuminuria in adult Koreans: the 2011 Korea National Health and Nutrition Examination Survey. PLoS One. 9, e109073. Ogura, M, Kimura, A, and Takane, K (2012). Estimation of salt intake from spot urine samples in patients with chronic kidney disease. BMC Nephrol. 13, 36.